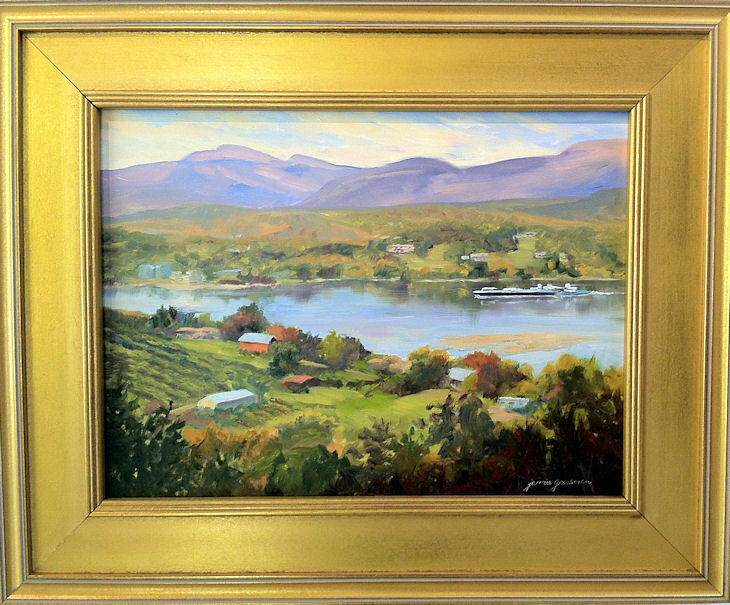 At the northeastern edge of the Catskill Mountains lies Winter Clove, home to many stunning ravines and waterfalls. This one, along the Kiskatom Creek, has a beautiful covered bridge above it, and a clear, nearly viridian-covered pool at the bottom. I went for a hike here with my husband, and had to make a return trip with my paints! 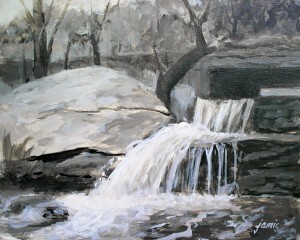 This is one of the little waterfalls at our place in upstate NY. With all the rain we’ve had this year, my springtime retreat time has been extended, and this little gem is still running full force even though we’re almost into July! 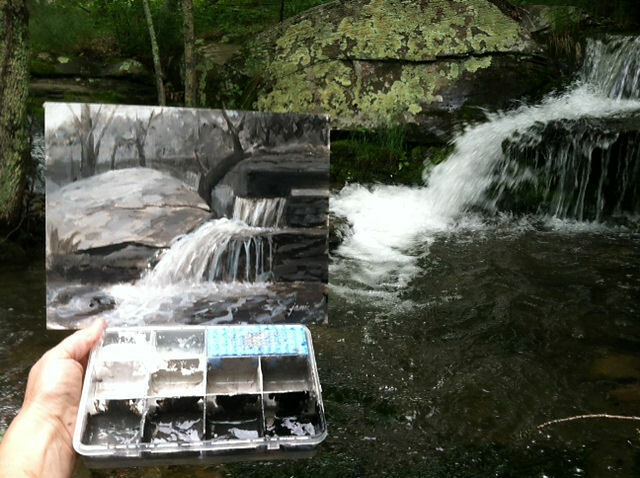 Painted on location in the Catskills. 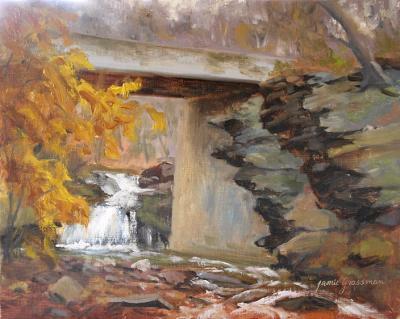 This is one of those scenes that I had my eye on for a year or so before I had a chance to get out there and paint it. The location is very close to a dramatic waterfall, so I always ended up painting the falls instead! 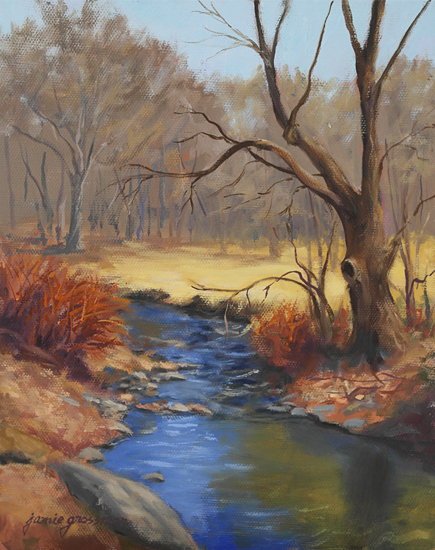 I went out there several days in a row, and so finally had the opportunity to sit by the quiet, meandering stream with my paints. 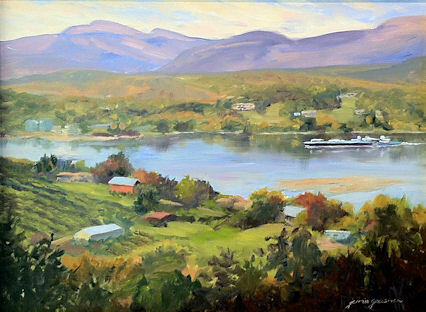 You can click this image above for a larger, clearer view of the painting. 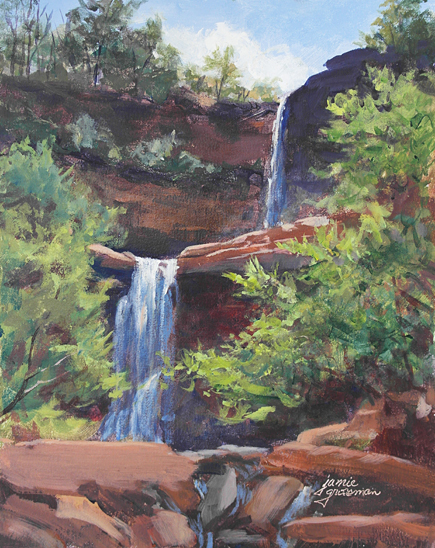 This is one of a series of three Kaaterskill Falls paintings done on location in acrylic. 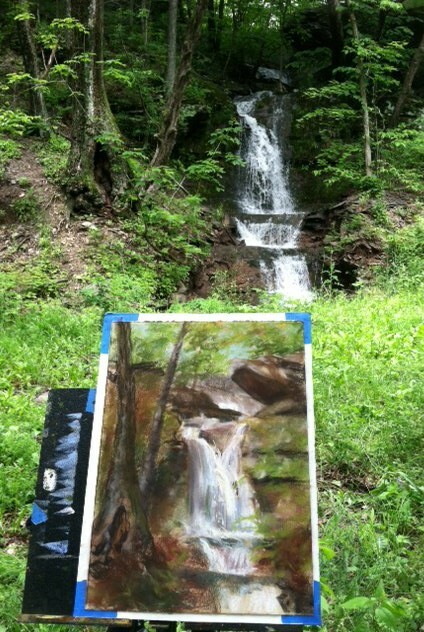 It’s the tallest waterfall in New York State, and was a favorite spot for the Hudson River School artists. There is a lot of construction going on by the falls now to improve access for the public. In the short term, that has meant limiting access so that they can do the work! Fortunately, I did a bunch of paintings up there early in the season, so I don’t mind taking a little break from it now. I’m looking forward to checking out any new vantage points once the trail work is completed. 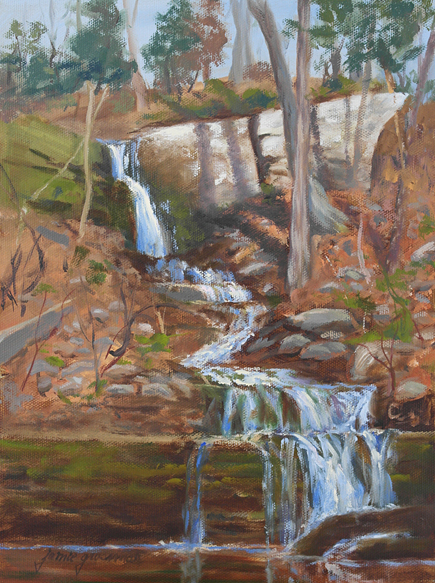 This is yet another waterfall, painted out on location in early spring when the runoff from the mountains is spectacular! I call this one Mossy Falls, since the wet ledges become covered with moss as the temperatures warm. I love this old maple tree that overhangs the creek. Once the summer greens take hold, it’s much harder to appreciate the shape and structure of these stately, graceful residents. 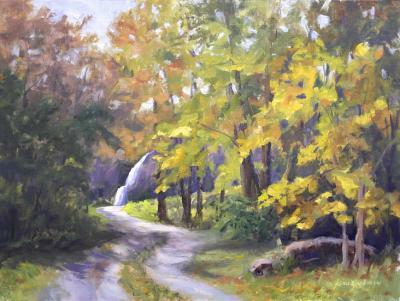 I don’t often get out here to paint before the meadow beyond it loses the golden color, but this year I was determined. $325.00 plus $25 shipping and insurance within the Continental United States. For local sales, shipping charge will be allocated to NYS Sales Tax. Please email me at JamieWG@aol.com for International purchases or with any questions. The waterfalls by my house are raging this time of year as the snow melts up on the mountain. This waterfall is always the first one to dry up, so I was determined to paint this one first! Most years, by the time I get out there, it’s already dry. 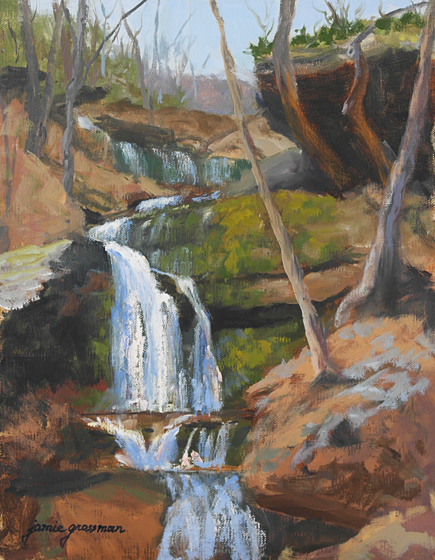 It used to be a split waterfall, running in two cascades, but for some reason, that second water trail is blocked, so I just painted it as a single fall. I’ll have to climb up there to see what’s blocking the left side! 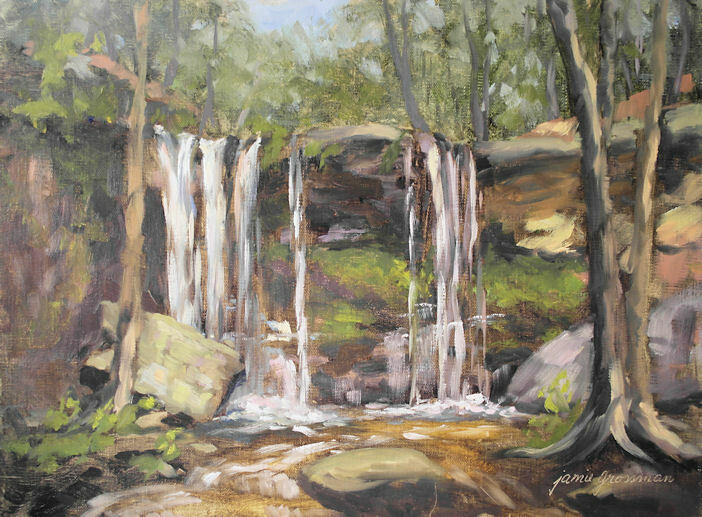 The most dramatic feature to this waterfall is the large, white slab of rock that juts off to the right. This spot along Catskill Creek is one of the locations frequented by Hudson River School artist Thomas Cole and others. 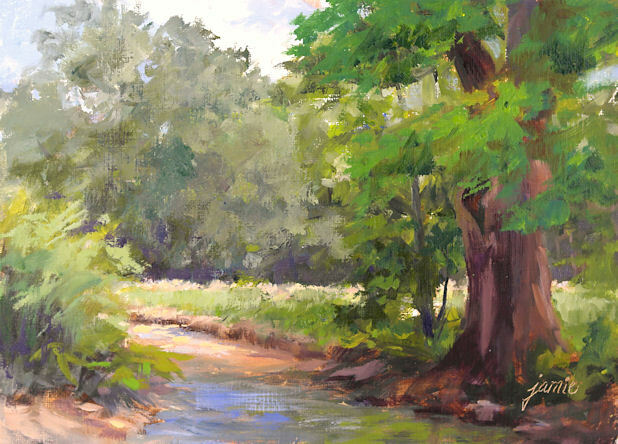 I was drawn to the brilliant morning light flashing off the enormous rock formation along the creek, creating strong contrasts with the dark greens alongside it, and the warm colors in the water. I used a combination of different types of acrylics for this painting, starting with the new Golden High Flow paints and transparent drips and splatters, and gradually moving to heavier bodied, opaque paints to solidify the forms and bring the work to completion. This is one of my favorite ways to work. I love the complexity it yields, with so many different techniques working together in harmony, yet maintaining a looseness and some abstract qualities. This was painted on location using Neutral Gray paints that are made by Golden. After doing the sketch in monochrome, I decided to glaze color over some of it. I covered the painting with plastic wrap and experimented with a few different ideas by painting over the top of the transparent covering. Once I decided to bring some greens into the focal area of the painting, I removed the plastic wrap and glazed directly onto the painting. I liked the minimal burst of color added to the monochrome painting, though I like leaving these just monochrome too. $1,050.00 plus $45 shipping and insurance within the Continental United States. For local sales, shipping charge will be allocated to NYS Sales Tax. Please email me at JamieWG@aol.com for International purchases or with any questions. This has been sitting on my easel awaiting changes for awhile now. Every time I think I’m finished, I see that “one more thing”! I spent some more time with it this week and I feel I can call it done now. 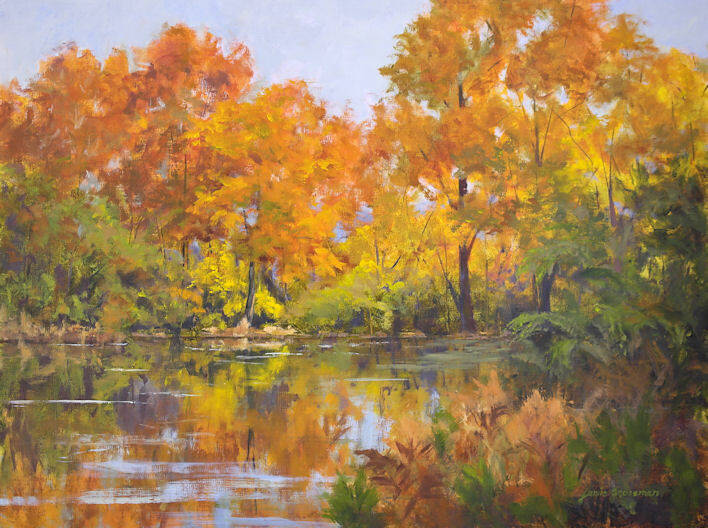 It’s an 18×24″ oil painting of a scene overlooking a beaver pond at the height of fall foliage. I’ve worked off several photo references taken at our place upstate. It is a secondary pond that the furry engineers built once the first pond filled to capacity. The dam got too high to withstand much more pressure, so the clever critters built a lower pond to give it more stability. This second pond backed up the water to the primary dam to relieve pressure, and extended their food source into the woodlands along the stream. There was a little peninsula of land left in between the ponds, where I stood to take the photo references. Since then, they were trapped out due to property damage suffered by neighbors with the high water levels and runoff. The two streams that converge there have resumed their uninterrupted course through the woods, and this pond is no more. 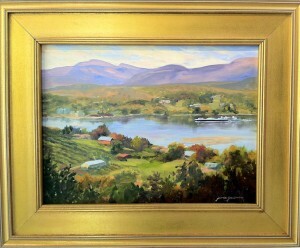 I have several paintings I’ve done there that remind me of what it looked like with the pond. Given the usual play of events, I suspect we will see another dam here within a couple of years! $400.00 plus $25 shipping and insurance within the Continental United States. For local sales, shipping charge will be allocated to NYS Sales Tax. Please email me at JamieWG@aol.com for International purchases or with any questions. 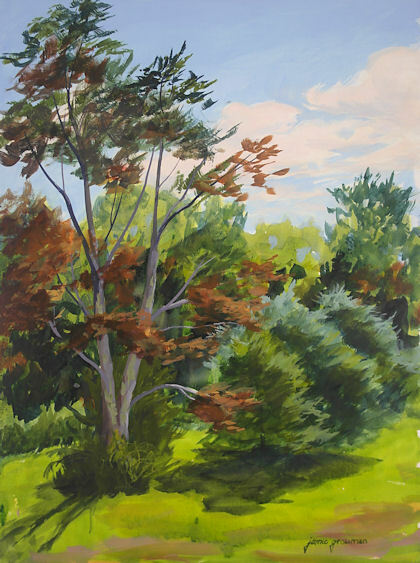 I went out on the patio with my paints on this gorgeous, nearly-Autumn day, enjoying the sounds of birds nearby and waterfalls in the distance while I painted. 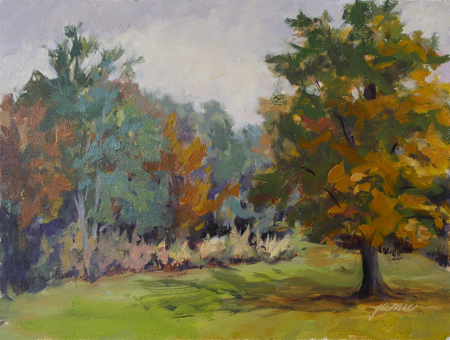 The fall colors were just starting to creep into the landscape. I love this time of year! $525.00 plus $25 shipping and insurance within the Continental United States. For local sales, shipping charge will be allocated to NYS Sales Tax. Please email me at JamieWG@aol.com for International purchases or with any questions. This is my converted barn artist’s retreat, which sits at the base of the Eastern escarpment of the Catskill Mountain range. 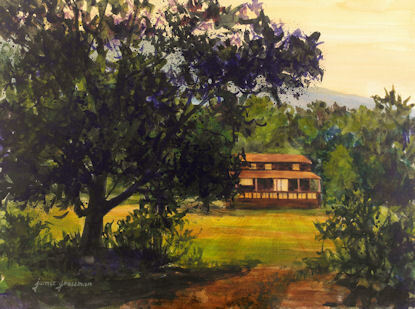 At twilight, the mountainside and tree line have the sun behind them, throwing light up toward the sky, and the lights in the house glow yellow-orange from the reflection of the warm wood interior. The long row of windows at the bottom is my studio. 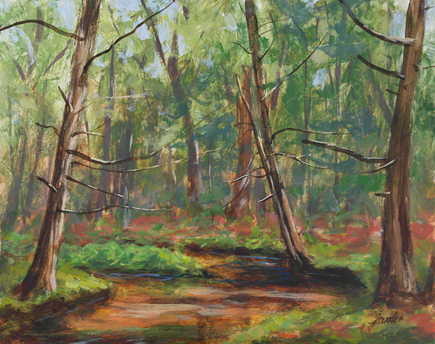 This painting makes me feel like I’m coming home at the end of a day out hiking in the woods, which is exactly what I was doing when I took the reference photo from which I did this painting. I hope you can also feel like you’re stepping off the woodland trail, and welcomed by the glimmering lights from within the house. This painting was done with the brand new Golden High Flow acrylics, which I just got a few days ago. I’ll be posting a review of them this week once I’ve had a chance to work with them a bit more, so stay tuned! This wonderful old maple tree sits beside the creek in my yard, just downstream from the waterfall. That’s why I haven’t painted it until now! 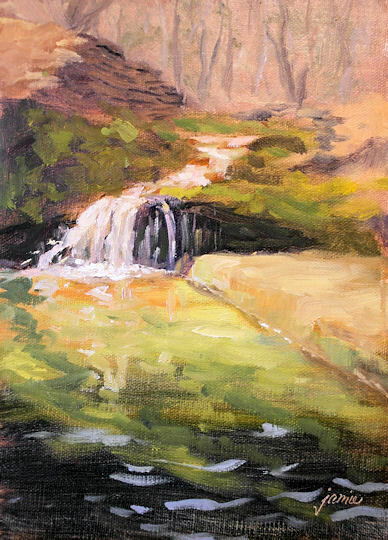 I always mean to paint this downstream view, but end up giving into the temptation to face in the opposite direction to paint the waterfall. In fact, there is so much painting potential from this one spot that I could probably do an entire show of paintings by just rotating a few degrees every couple of days and painting what lies in front of me. Now that I’ve done this one, I’d like to do three more facing this way. One would be a larger version of this scene. A second would be this scene, but with a high horizon, so it could focus on the water reflections in the foreground and the transparency of the crystal clear pool there. A third would be a painting of a closer view of the tree trunk, in a vertical orientation. I’d best get busy! $295.00 plus $30 shipping and insurance within the Continental United States. For local sales, shipping charge will be allocated to NYS Sales Tax. Please email me at JamieWG@aol.com for International purchases or with any questions. 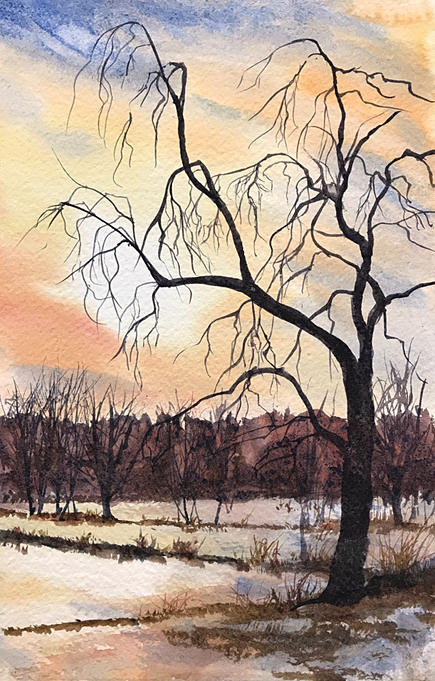 I had a tough time getting the values to show correctly in the photograph. It’s ever so much easier to adjust the highlights and shadows in a photo than it is to do midtone adjustments. It looks so much better in person! In any case, I’m quite happy with the way the actual painting turned out. I am trying to use all my willpower to leave it as it is and not glaze it with color! Perhaps I will also do a color version in the future, and definitely there will be more monochrome paintings coming too. $295.00 plus $20 shipping and insurance within the Continental United States. For local sales, shipping charge will be allocated to NYS Sales Tax. Please email me at JamieWG@aol.com for International purchases or with any questions. 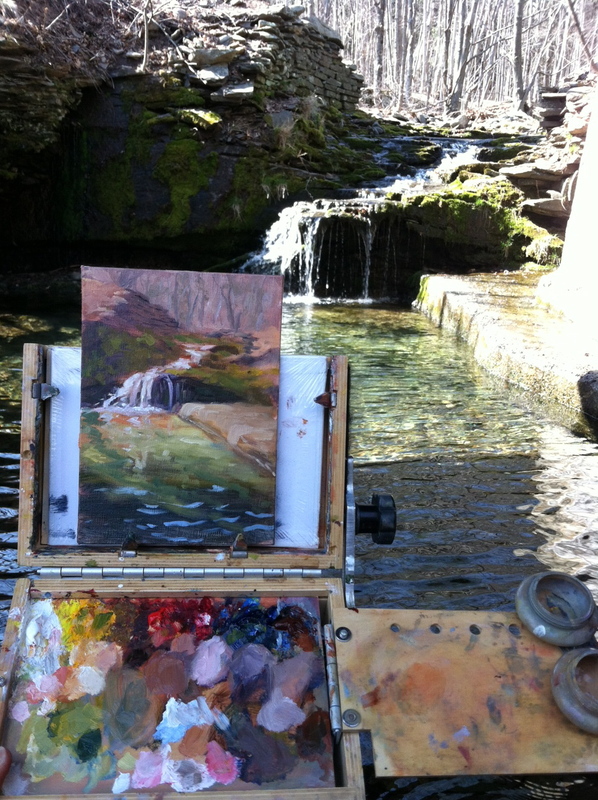 I posted a photo of this scene the other day with the waterfall in progress. I keep thinking it’s done, and then end up reworking sections of it. Maybe it is done now, but if not, you’ll see it posted again with revisions! It sure does seem like “Waterfall Week” here on my blog. Actually, only two of the ones I’ve posted this week were done this week. For some reason, the others just didn’t make it up on my website until this week. 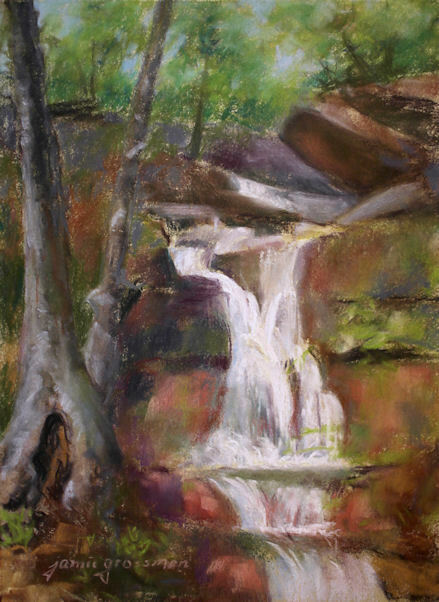 However, it is true that I never seem to tire of the challenge of painting waterfalls. 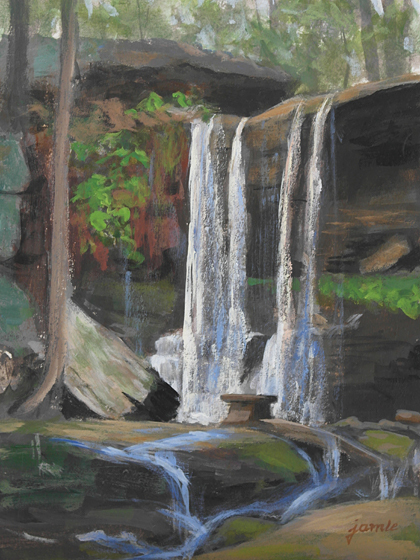 We’ve had tons of rain this week, and they are predicting a lot more over the next couple of days, so I think it’d be a safe bet that more waterfall paintings will be coming off my brushes in the near future! I’d posted an image of this painting with the scene quite awhile ago, promising to eventually get up an image of just the painting. Here it is! It’s been on my drying rails and is now ready to varnish and go off to a new home! I love those early spring colors. I appreciate it that much more, now that the summer greens have overtaken the landscape! $175.00 plus $15 shipping and insurance within the Continental United States. For local sales, shipping charge will be allocated to NYS Sales Tax. Please email me at JamieWG@aol.com for International purchases or with any questions. Every so often, I really enjoy working in monochrome. Often that means sketching in sepia tones, or painting with a specific color base. But I also really like working in grays. Golden Acrylics makes that easy to do with their Heavy Body Neutral Gray series. I keep them loaded in this sealed container with dividers. Any time I want to work in black and white, I just grab the container and I’m good to go. 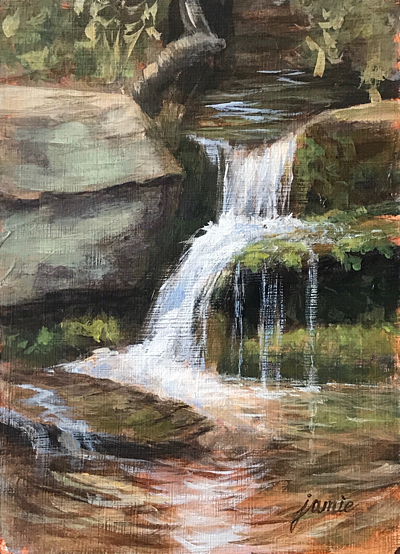 Even though these are traditional, fast-drying acrylics, I was amazed by how much working time I had with them while sitting by rushing water! The air must have been heavily laden with mist, because I could blend and blend to my heart’s content. It was like working with oils. I generally keep one of those sections in the container for Acrylic Glazing Liquid, which extends drying time, but I didn’t need to dip into it. One of the best things about working this way out in the field is that I don’t need a palette! With all the values premixed, and no color mixing to do, I can dip right into whatever value I need as I go. Generally I’ve done these as studies in my sketchbook, but I absolutely loved doing them on panels, so you can expect to see lots more monochrome paintings on archival surfaces coming off my brushes. It’s the complement to my Color Inspirations series! 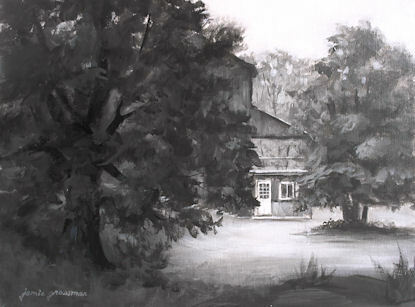 I started a large painting on paper, and while waiting for my first layer to dry, I decided to do a monochrome sketch using some Cretacolor Sepia Powder. This just arrived with my last art supply order. It looked like lots of fun and I couldn’t wait to give it a try! I started laying in tone by brushing the powder onto the surface of a pristine sheet of beautiful Rives BFK — a 100% cotton rag paper that is one of my favorite toned surfaces. It wasn’t long before I needed to work in some lights, and realized that I didn’t have a white Conte in my sketch box with the powder! Uh oh! I remembered that I had some pastels in my car, so I figured I’d take the white from that pastel kit. Well, you know me — the color junkie! With all those gorgeous pastels in front of me, there was no way I was going to resist adding some splashes of color, and then some more. 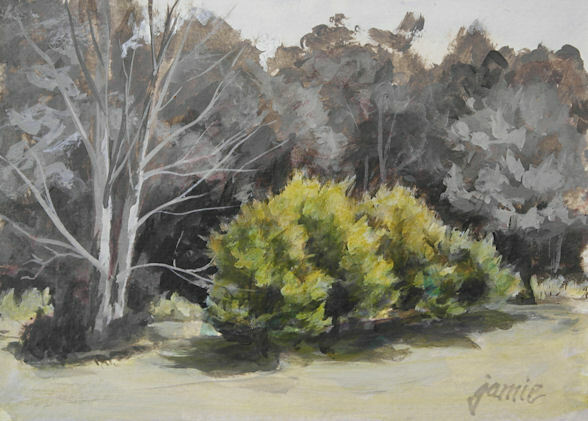 Before I knew it, I was way engrossed in creating a pastel painting instead of the monochrome sketch I’d intended as a time-filler while my other painting dried! I wasn’t all that happy with the way the other one was turning out, so I persevered for awhile with this one and really liked where it headed. I went back this morning and tweaked it a bit to finish it off. I’ll post that image as soon as I can get a photo of it. As for the other painting, it only went from bad to worse. I went back at it again today, but couldn’t save the beast! Plein air painting can be a very humbling experience. However, I’m pleased with this one. I never would have thought to use Rives BFK for pastels, and I hadn’t initially intended to do this as a pastel piece. It turned out to be a pretty awesome pastel surface. I might even do it again on purpose sometime! 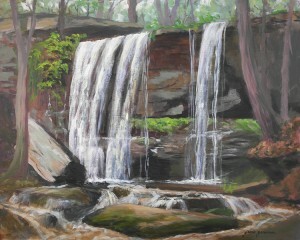 I just can’t seem to get enough of waterfalls, and spring is usually the best time to capture them. 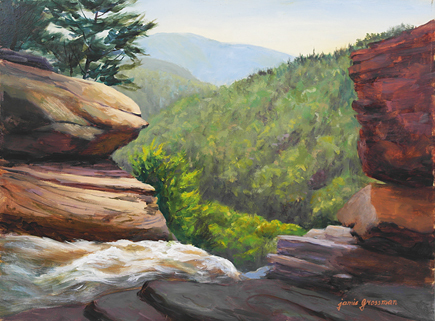 The heavy spring rains, combined with snow melt from the mountains, usually causes them to run heavily this time of year. This year has been relatively dry, so they are not as full as they usually are in April. I’m hoping for some of those “April Showers” to come along soon! Still, there was plenty there for my painting purposes. 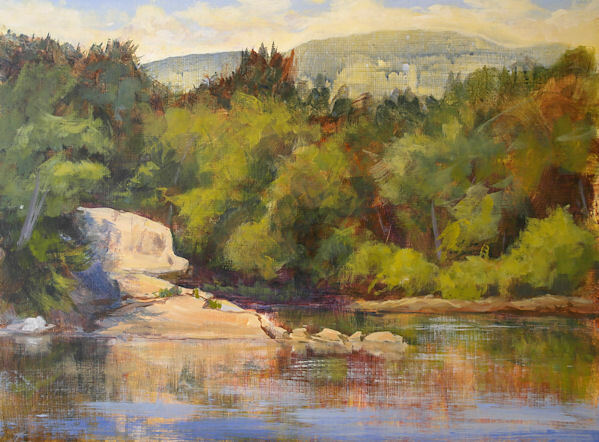 I loved the greens and yellows in the shallow, clear water, so I chose a composition to showcase those elements. 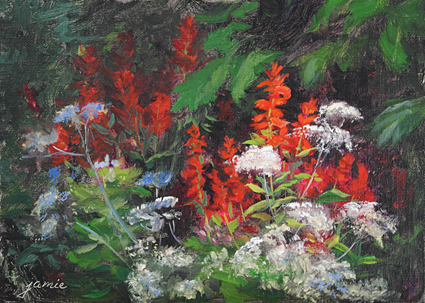 I used a limited palette of Cadmium Yellow Medium, Pyrrole Red, Ultramarine Blue, and Titanium White. Once I get a better photo of just the painting, I’ll add it to this post. That could be awhile though. You may have noticed that I haven’t posted any paintings for quite some time. We’ve had deaths and illnesses in the family over the past few months. What little time I’ve had for my art I’ve spent painting rather than photographing images and posting. 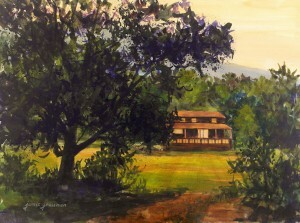 I have several more paintings to post and will try to get them up over the next week. Hopefully, with the good weather upon us now, I’ll be able to venture out with my brushes more and take in the natural beauty that inspires me. Thank you all for checking out my work here. This was painted on location at a favorite spot deep in the woods. Last year when I was at the Vedder Library going through sketches by Hudson River School artists BBG Stone, I came upon a sketch he’d done from this very spot! 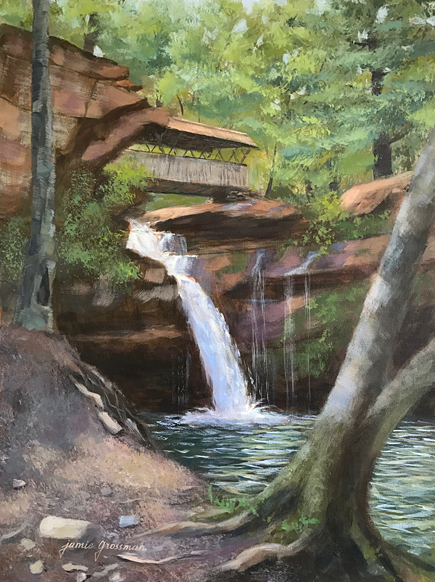 I recognized it immediately because of the shape of the huge boulder at an angle at the base of the falls, and also a rock outcropping that is just out of the view of this painting. It was very exciting for me to know that he’d been here also.